Hi, it’s Jenn, from Eat Cake For Dinner. 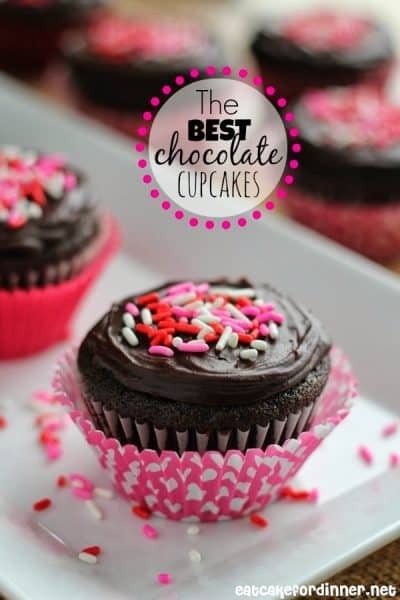 I’m back again sharing one of my absolute favorite cupcake recipes with you. When I was young, I had never heard of, or seen, a red velvet cupcake. It wasn’t until I was an adult when I first discovered red velvet cake. Honestly, I think I first saw a red velvet cake on an episode of Paula Deen on T.V. and I had to try this interesting cake right away. This has been my go-to red velvet cupcake recipe for years and years and I’m sure it will become your favorite too. A moist red velvet cupcake with a light texture and a slight chocolate flavor. Topped with a rich and creamy cream cheese frosting. Fill cupcake liners ⅔ full with batter and bake in preheated oven for 17-18 minutes or until a toothpick inserted in the center comes out clean. Do not over bake. Repeat with remaining cupcakes. Cool completely and top with Cream Cheese Frosting. Makes about 3½ dozen cupcakes. For the Cream Cheese Frosting: In a large bowl, mix together butter, cream cheese, salt and vanilla until smooth. Add powdered sugar, one cup at a time, beating well after each addition. If frosting is too thick, add a little milk. If you are planning to pipe the frosting onto the cupcakes, you want it thick enough to hold its shape. This makes enough frosting to pipe a big swirl on the top of each cupcake. I used a Wilton 1M piping tip. *If you do not want to pipe a large swirl onto each cupcake and prefer to spread a small layer on top instead, the amount of frosting can be cut in half. I recently lost my red velvet cupcake recipe. I searched online for quite a while, reading reviews, always *just* about to print the recipe but hesitating because of the one-off comments some people made. I finally found your recipe and it sounded great. I made them last night and they were delicious! Sent them to school with my kids today. Thanks for the great recipe! Can you use all purpose flour instead of cake flour? Just wondering because I don’t have enough cake flour but I could go to the store sometime. Just wanted to know. Thanks and your recipes look great as always! All purpose flour works perfectly!! Hey i made these cupcakes and they were awesome !! My client loved them too !! I have to make a cake now.. will the recipe work for a cake as well? Your cupcakes look amazing….but im wondering can you use all purpose flour instead? It would be nice to know the quantity this recipe makes. I find this issue with a lot of recipes that no one ever lists the yield. Your directions state to line a muffin tin. but this could be a 12 or 24 count? I made this recipe for my daughter’s birthday. The recipe makes a little over three dozen. hi Alyssa, just wondering if 3.5 dozen of small cupcakes or medium? i am going to try your recipe for a kid’s birthday party at school. it going to be cupcakes and cake.. please help.. thank you . As I write this the second set of mini cupcakes are in the oven, I also baked a cake with your recipe. 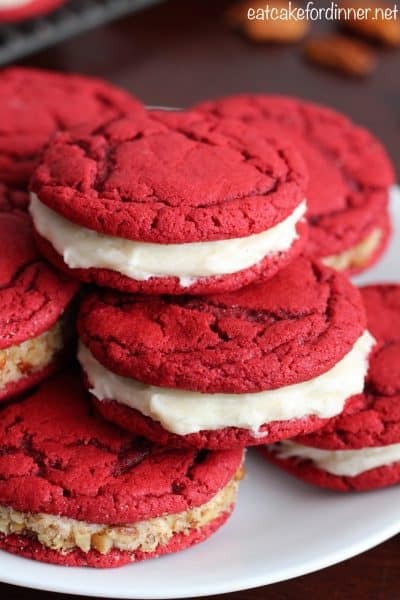 My husband loves red velvet and I never liked it but omg I can eat this recipe everyday. Your red velvet Is so moist, so tasteful, so everything. This is definitely a keeper and I recommend whoever is thinking about making this not to think and just make it. Thank you, thank you, thank you! How long should I bake mini cupcakes for? I just made these and they were soooo dense.. it was like a bread loaf.. I’m going to try them again and hope it was some little error I made ): Also this recipe made me 28 cupcakes! I would like to halve this recipe, but can’t halve 3 egss. Have you ever made this for a smaller number of cupcakes? These look amazing — can’t wait to try them. Approximately how many does the recipe make? Made these yesterday, and they were quite delicious. very tender cake and frosting was yummy, and not overly sweet! My kids loved them! OMG the best cupcakes ever! My daughter and I tested out the new kitchenaid mixer I got her for Christmas. This is our first attempt at making anything from scratch. Delicious, moist and flavorful. Just follow the directions! The cake is the recipe my Grandma passed down over 60 years ago, however you are not doing it justice using cream cheese frosting. There is NO better frosting for a red velvet cake than the old fashioned cooked icing. Could you use all purpose flour for this recipe? Thanks. How many cupcakes does the red velvet recipe make? These cupcakes are super delish!! Red velvet is my hubby’s fave! He and my kids loved them!!! And even better because they’re homemade!! Thank you for sharing this recipe!! Blessings to you and yours!! ??? AMAZING red velvet cupcake recipe, made this a couple of times and all the family loved it. Hi, I live in Europe and its quite tough to find buttermilk. Is there any supstitute fir it? Can I use neutral cream or something like that? And, please advise which cream cheez shouldI use? When you say 12tbl butter, how much that turns out in grams (or oz.) ? Sorry for all this questions, I don’t cook much 🙂 Thank you! I’m trying these for the first time,. The cupcakes didn’t rise very well, they kind of spread out. Any recommendations so they can rise. They are super most and delicious! Mine also turned out a dirty pink with brown patches which I wasn’t expecting. How much cupcakes does this recipe make? I followed all the instructions and cooked them until the pick was clean. But for some reason mine looks more chocolate cupcakes with tiny hint of red then bright red like the picture? I used the right amount of unsweetened cocoa powder, so I donno what I’ve done wrong. They taste great though. So exactly how much red food coloring is needed to make it bright red like the picture? Will the amount of frosting from this recipe be enough to frost the 2 or 3 dozen cupcakes this recipe yields? I don’t want to run out. Thanks! Have you ever tried this recipe with a giant cupcake pan? If so does the quantity of ingredients need to be adjusted? I would love to try this for my sons Mickey Mouse themed birthday party. Thank you. Hi i want to make those cupcakes how many grems is 2 stikes of cream cheese? 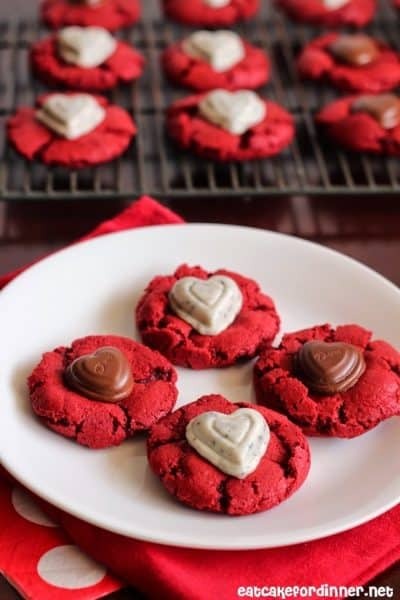 If you make these the night before to take to work, do you recommend icing them night before as well/completely making them & then putting them in tupperwares with lids in fridge? Would that dry out the cupcakes or the frosting? Or do you suggest just making the cupcakes, keeping in container with lid on the counter overnight & then make the frosting in the morning & decorate? Thx! I would suggest making the cupcakes and the night before and then making the icing the morning of and decorating them then if possible. The icing will be okay to make the night before but it won’t have the same smooth consistency. How many cupcakes is this recipe recommended for ? Thank you for this FAB Recipe! I made these for my kids and husband and they couldn’t get enough! Delicious and definitely the best red velvet cupcake recipe ? I tried this recipe over the weekend for my daughters 18th bday. They were a hit! The cake was lite and fluffy and had a great flavor. The icing was not too sweet but the cake was not moist. I followed the recipe exact. I live in NC so not at a higher elevation to have to adjust baking. These turned out extremely dense. The flavor was nice but I wasn’t thrilled with the texture. i’m just getting into baking and have never attempted red velvet before. made these tonight (with all purpose flour) and they turned out great! very light and moist. will definitely be adding this to my recipe book! IS IT RIGHT THAT I AM SUPPOSED TO SPRAY THE LINERS, NOT THE PAN? Yes, you are correct. TBL means Tablespoon. tps means teaspoon. I’ve been searching for a red velvet scratch recipe for some months and this was the ONE!!! It’s a big hit. I do wonder though if this can be used to make a layer cake?? Thank you! I want to try these cakes but a little confused on how much 3 1/2 c is in ounces?